Margot Robbie confirmed for Suicide Squad 2. Coming hot on the heels of the news that both Jai Courtney (Captain Boomerang) and Viola Davis (Amanda Waller) are set to return, Variety has revealed that Margot Robbie is now confirmed to reprise her role as Harley Quinn. Robbie is currently shooting the DC girl gang movie Birds of Prey (And the Fantabulous Emancipation of One Harley Quinn), which is slated for release in 2020. The trade suggests that Courtney, Davis and Robbie will be the only three cast members from the 2016 movie to return for Gunn’s film, although Discussing Film is also claiming that Joel Kinnaman will be back as Rick Flag. Suicide Squad 2 is set for release on August 6th 2021. Teaser Trailer and Poster for ‘Once Upon A Time in Hollywood’, which will be released in July. The official posters and teaser trailer has been released for Margot’s next upcoming movie ‘Once Upon A Time’ where she plays 60’s Hollywood actress Sharon Tate who was brutally murdered by Charles Mansons followers. Margot Robbie has shared sneak peek photos from her upcoming bank robber thriller, Dreamland. The Australian actress shared the stills on Friday, where she could be seen cuddling up to male co-star Finn Cole behind the wheel of a vintage vehicle. The 28-year-old used the Instagram post to promote the film’s anticipated premiere at the Tribeca Film Festival in the coming weeks. The film, which Margot and her husband Tom Ackerley produced, is set during the Depression-era in Oklahoma and centres on a young boy’s search for a fugitive bank robber, played by Margot, who has a bounty on her head. Margot embraced her natural beauty in the first preview photo, pictures behind the wheel with little makeup on and her blonde locks messily brushed off her face. The man in the photo is English actor Finn Cole, 21, who appears to play one of the Hollywood star’s love interests in the film. 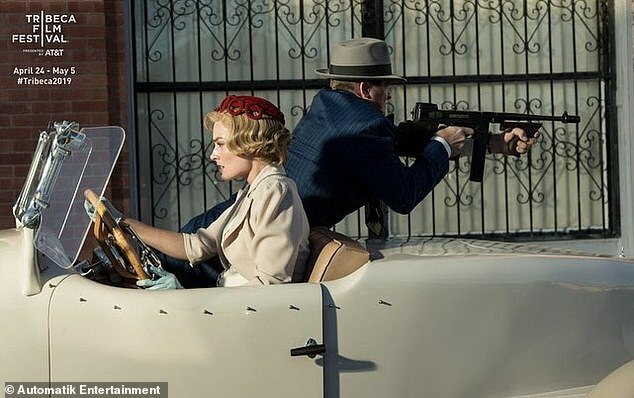 Margot was also pictured in a different scene, where she was driving a car alongside her gun-toting co-star Garrett Hedlund. ‘Our film Dreamland will be premiering at the 2019 @Tribeca Film Festival!! Tickets will go on sale on March 26th. See you there! #Tribeca2019,’ she boasted in the caption. The film is directed by Miles Joris-Peyrafitte and will also feature another Australian actor Travis Fimmel from the series Vikings. Nicole Kidman and Margot Robbie ‘are in the running’ to play gangland lawyer Nicola Gobbo in Foxtel’s new TV series. Nicole Kidman and Margot Robbie are reportedly being considered to play the lead in a new Foxtel series. The Sunday Telegraph believes that the two actresses are part of a possible list, that also includes Naomi Watts, Elizabeth Debicki and Asher Keddie. Foxtel has commissioned an eight-part series, Lawyer X: The Story of Informer 3838, based on the life of gangland lawyer and police informant Nicola Gobbo. ‘Our ambition is to cast someone who is brave and ready to embody this complex and controversial character and her story,’ Brian said. The Sunday Telegraph understands that the series will be based on articles published by The Herald Sun, with journalists acting as consultants. On Friday, Nicola was finally unveiled as the mysterious ‘Lawyer X’ who for years had passed confidential information from her gangland clients – including Carl Williams – on to police. For years, her dangerous double-life was kept a secret until it was lifted by the High Court last week. Victoria Police argued that identifying Nicola as ‘Lawyer X’ would put the lives of her and her two children at risk. The full bench of High Court judges agreed, but said there was more at stake. ‘Large though those considerations may be, they do not detract from the conclusion that it is ­essential in the public interest for the information to be disclosed,’ they told the court. Immediately after the decision, Nicola and her two children went into hiding. Margot Robbie’s LuckyChap, Paramount Team for Musical ‘Big Gay Jamboree’. Alethea Jones is attached to direct the feature that just got set up at Paramount. Margot Robbie is stepping into the world of movie musicals. The Australian A-lister and her LuckyChap Entertainment production company will produce Big Gay Jamboree, a period musical that just got set up at Paramount. Alethea Jones is attached to direct the feature project that will be written by rising scribes Marla Mindelle and Jonathan Parks-Ramage. Jamboree tells of a young woman who, after waking up in a strange town, realizes that she has been transported into a 1940s musical. She brings her modern, raunchy sensibility to this more naïve world and meets new friends along the way who help her figure out what happened and how she can find her way home. The project has been described as being tonally in the vein of The Book of Mormon, the envelope-pushing musical comedy about two missionaries in Africa, and Oklahoma! The latter is the classic (and wholesome) Rodgers and Hammerstein musical centering on a love triangle in turn of the 20th century in the American Midwest. Robbie, who will not star in the project, will produce via her LuckyChap banner and partners Josey McNamara and Tom Ackerly. Ari Lubet, Greg Walter and Dave Becky of 3 Arts will also produce. Vanessa Joyce will oversee for Paramount. LuckyChap is repped by CAA, Management 360 and Jackoway Austen. Jones is with Paradigm and Lichter Grossman. Parks-Ramage and Mindelle are repped by 3 Arts and Hansen Jacobson. Margot made the cover of Elle France magazine, the cover and photoshoot have been added to the gallery.